Incident Six, 2014. Oil on linen, 48 x 52 in. Plum Orchard, 2014. Oil on linen, 36 x 30 in. Father's Birthday, 2015. Oil on linen, 48 x 50 in. Ilves, 2014. Oil on linen, 60 x 48 in. Figures in a Landscape, 2015. Oil on linen, 50 x 60 in. Ruralia, 2015. Oil on linen, 52 x 48 in. Day and Night, 2013. Oil on linen, 48 x 52 in. 1974, 2014. Oil on linen, 48 x 50 in. Wilderness Studio (End of Winter), 2015. Oil on linen, 50 x 60 in. Enclosure, 2015. Oil on linen, 36 x 30 in. Sylvan, 2015. Oil on linen, 60 x 50 in. Branch, 2014. Oil on linen, 50 x 60 in. Trebow, 2015. Oil on linen, 60 x 50 in. 26. Rosière 13 September 44, 2014. Oil on linen, 20 x 16 in. 7. Lessay (Ay River) 28 July 44, 2014. Oil on wood panel, 20 x 16 in. DC Moore Gallery is pleased to present Wilderness Studio, an exhibition of new work by Eric Aho that uses the painterly languages of representation and abstraction to explore the lived, remembered, and imagined experience of landscape. A catalogue with an essay by Nathan Kernan accompanies the exhibition. Aho’s engagement with landscape is informed by an interest in the people and histories with which it is intertwined. A visit to the remote atelier of Finnish painter Akseli Gallen-Kallela (1865-1931) sparked his interest in the metaphor of the wilderness studio. Aho relates, “the forest was his subject, and also the material for his studio. He lived in the middle of his work. The studio became symbolic of an imaginative container.” Paintings such as Logging Road (2015) and Unorganized Territory (Lake) (2015) allude to past and present realities of rural industry and politics in New England. Other works, like General Desrousseaux (2014), Sundial (2014), and Figures in a Landscape (2015), evolved from Aho’s ongoing project and his 2014 journey through the French countryside, retracing the route his father followed as an American soldier in World War II. In 2016, exhibitions of Eric Aho’s work will be on view at the Hood Museum of Art in Hanover, NH and the New Britain Museum of American Art, CT. 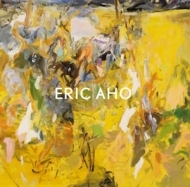 Recent shows of his painting include Eric Aho: In the Landscape at the Federal Reserve Board, Washington, DC (2013) and Transcending Nature: Paintings by Eric Aho at the Currier Museum of Art, Manchester, NH (2012). His work is included in the permanent collections of The Metropolitan Museum of Art, New York; Fine Arts Museums of San Francisco, CA; Museum of Fine Arts, Boston, MA; National Academy Museum, New York; Hood Museum of Art, Hanover, NH, and the Currier Museum of Art, Manchester, NH, among many others. Aho’s work has been shown internationally in Ireland, South Africa, Cuba, Norway, and Finland. He was elected Academician of the National Academy in 2009. Aho lives and works in Saxtons River, Vermont.